Size: 18 inch rope chain, pendant is 1 inch by ¾ inches. Desc: 10 karat yellow gold Black Hills Gold heart shaped necklace. The chain is rope link and is gold filled, has a spring ring clasp. 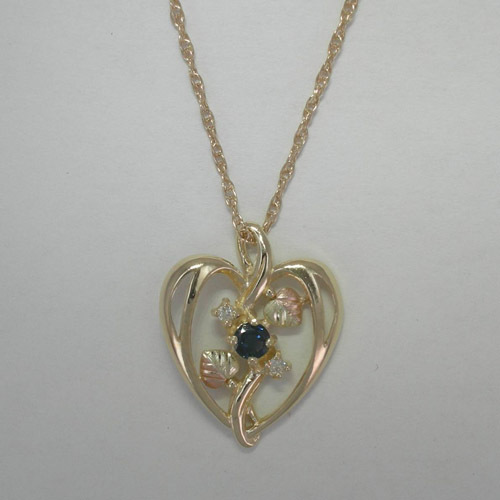 The heart shaped pendant contains one round faceted Sapphire with a diamond on each side. There are two rose and green gold leaves on each side of the Sapphire. The heart is open between the designs in the center. The necklace is made in the United States of America.